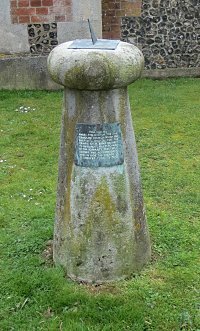 The sundial and plaque are situated on Crinoline Gardens (Private Estate) at the old Royal Marine Barracks in Eastney. Although close to it's original spot it has been moved, probably when nearby housing was developed. A stone sundial with square metal plaque attached to it. The legend on the plaque does not do full justice to the travels of the Crinoline Church. 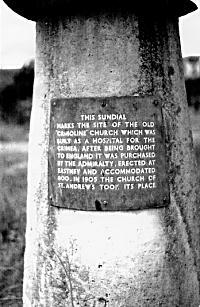 Before it reached Eastney Barracks, it stood in as a temporary church whilst St Bartholomew's was being built (at the junction of Campbell Road and Outram Road). That purpose concluded, it then moved on to perform a similar function during the construction of St Simon's Church on Waverley Road. The Ordance Survey map of 1861 clearly shows it's distinctive outline just north of the church. It would have been moved to it's final resting place in Eastney after St Simon's was consecrated in 1869. It is understood to have survived for 40 years at Eastney performing roles as both church and library. 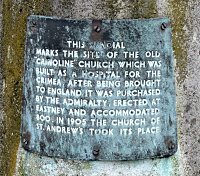 Ironically it's replacement, St Andrews only lasted about 70 years before being converted into flats. The story that the church was built as a hospital for the Crimea has been in circulation for a long time and yet there seems to be no documentary evidence to support this theory. Looking at the images we have of the church it appears to be most inappropriately designed for a hospital given that the main entrance is up a flight of stairs and that there is a vast amount of wasted space in the high auditorium.